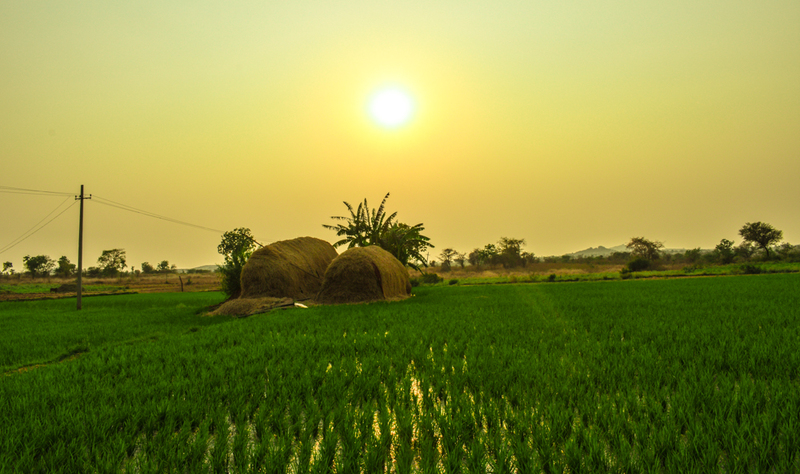 Riding to Srisailam through the thick forests of Nallamala was a great getaway time from the city life of Hyderabad. Read our voyage through Nallamala Forest here.. 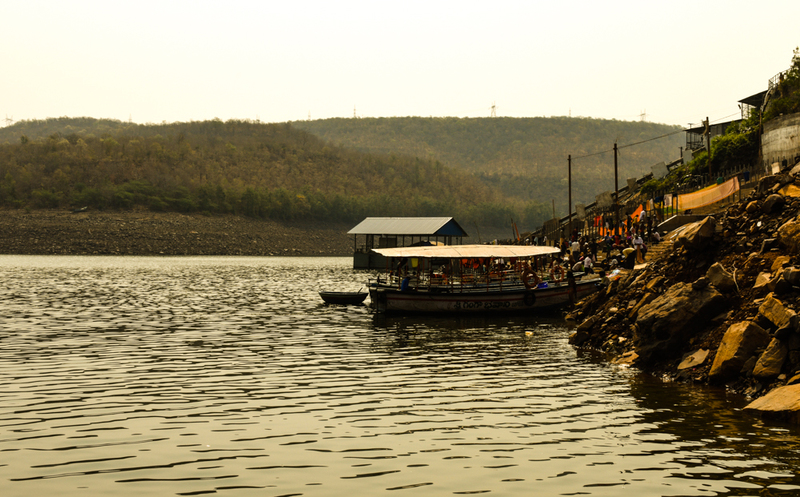 It took almost 5 hours to travel 220 Kms to reach the serene Srisailam town. We had arranged a room in one of the choultry(Yadava Satram) besides the temple. There is an entrance fee for the vehicles to Srisailam temple area of Rs.100. They have maintained the town pretty clean. After finding the room, we relaxed for a while. The choultry where we stayed were providing free lunch and dinner for those who stay there. Where you can imagine getting an ac room with all amenities like tv, heater and delicious Andhra cuisines for Rs.800?? Yes, that's the beauty of religious places . 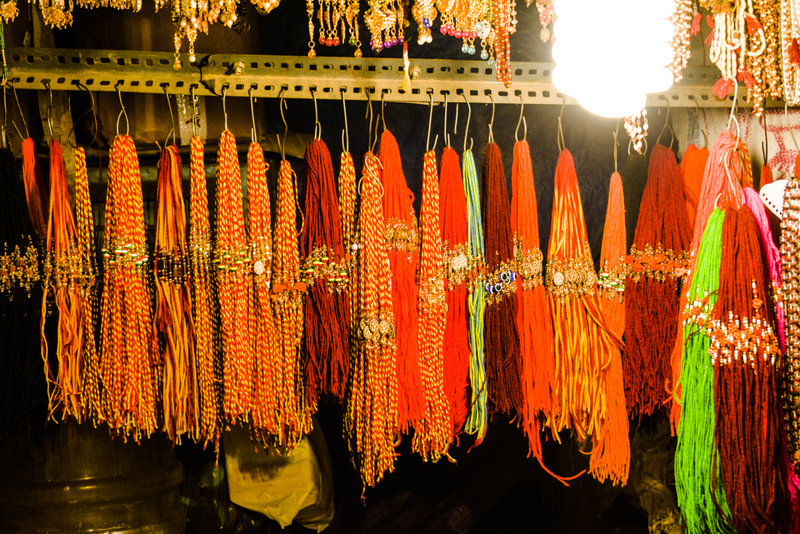 There are many decent choultries to stay in Srisailam. But pre-book your accommodation, as weekends can get pretty crowded. Saturdays, Sundays and Mondays are peak days when people come to visit the temple. So we had our fresh and tasty rice, sambhar and curries. By evening we thought of moving around the surrounding areas. A small temple nearby our stay. 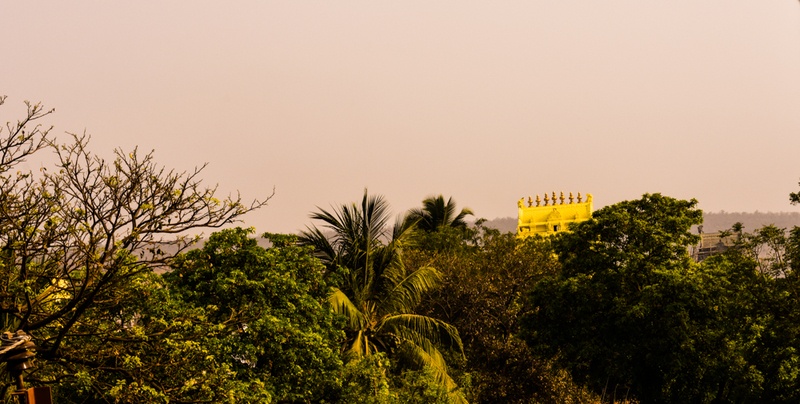 We drove down from the temple area, through the ghat roads enjoying the beauty of surroundings. Small huts as we drove down to the dam site. 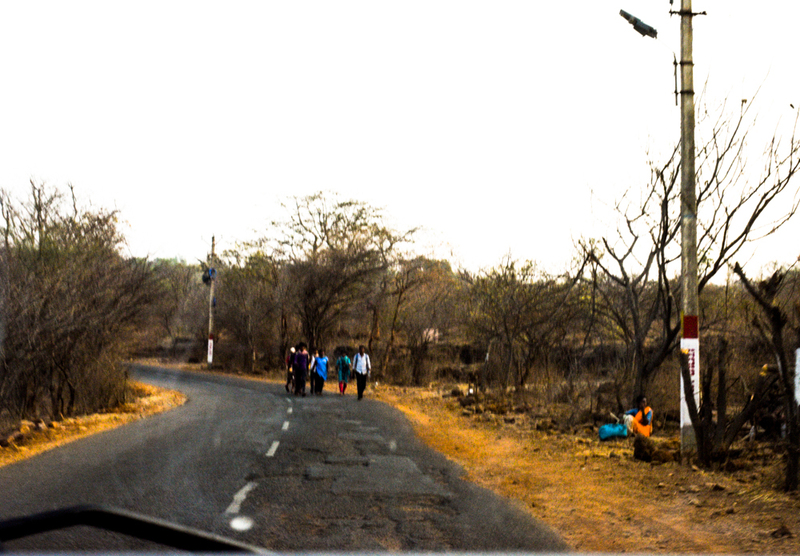 As we drove down the ghat roads to the dam side, we could see devotees trekking through the forest to reach the abode of Shiva. 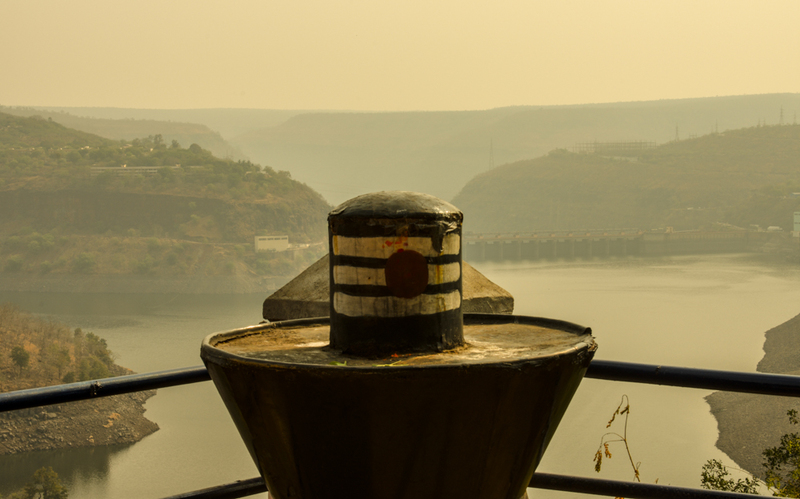 Srisailam is one among the jyotirlingas of India, which is in the holy town situated in Nallamala Hills of Kurnool district in Andhra Pradesh. 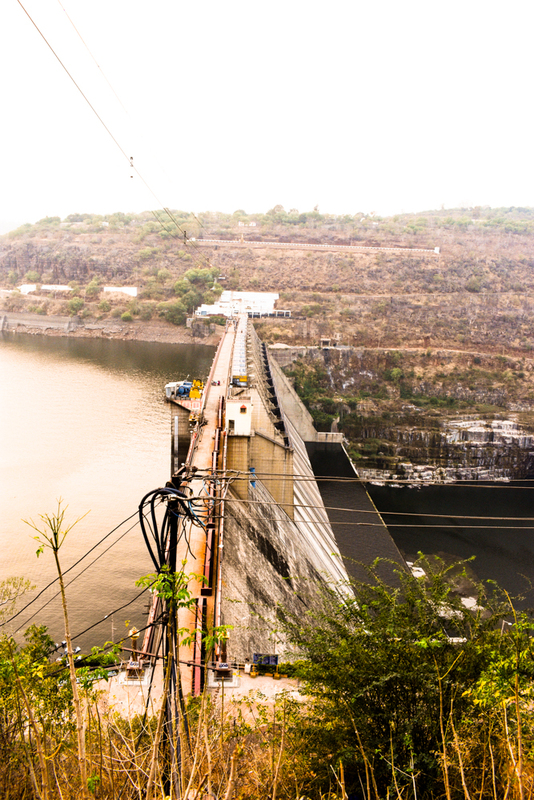 We drove down further to the Srisailam dam site which is around 15 Km from our satram which was close to the temple. There have been many viewpoints, where people can stop their vehicles and have a look at the dam which is built in the deep gorge of Nallamala hills. 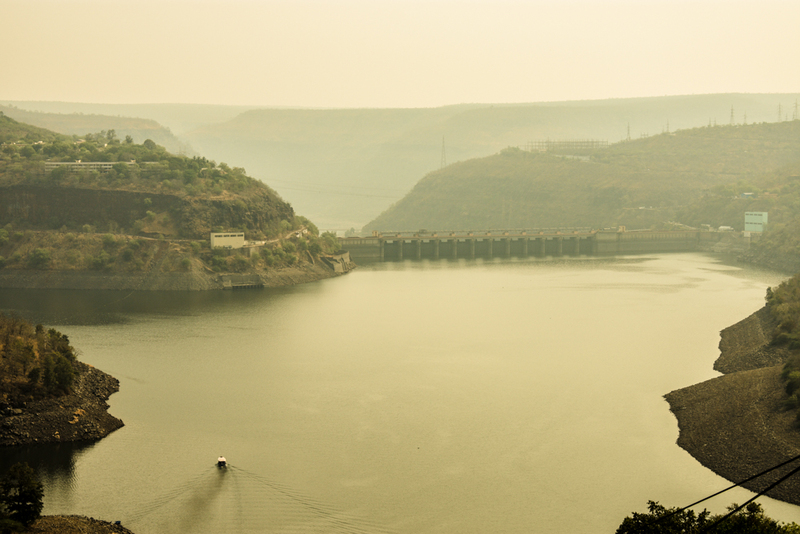 It is a multipurpose dam for irrigation and power needs constructed across the Krishna river. See the roads, which we came through, from Hyderabad. We were standing on the opposite hill which is part of Andhra Pradesh. The water level was very less at the time we went. 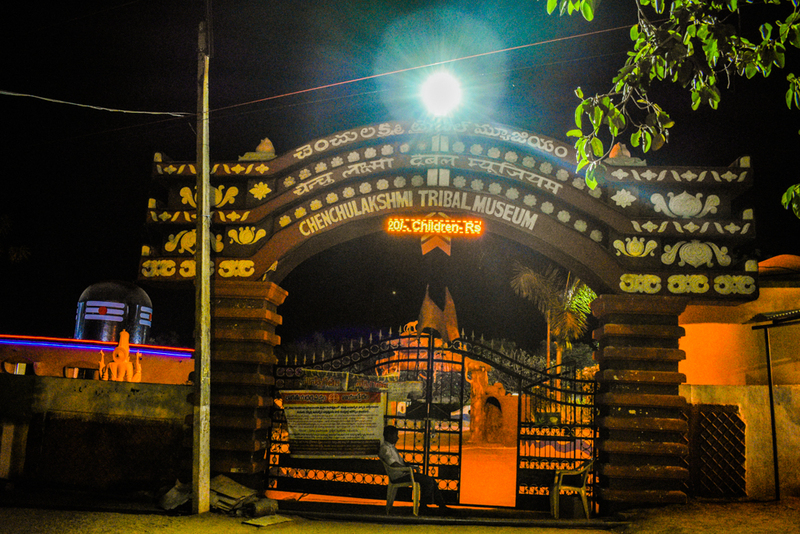 After enjoying the dam view, we came back to the Srisailam town, to visit the Chenchu Lakshmi tribal museum which is at the Srisailam entrance. 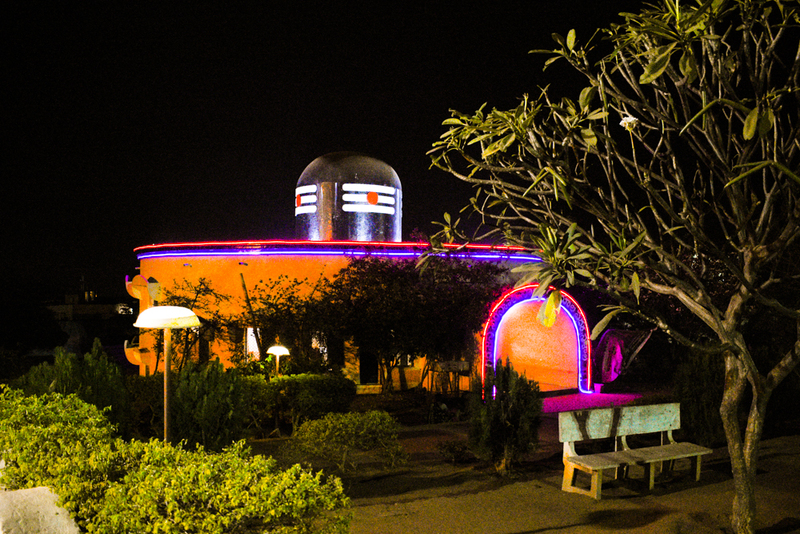 This museum displays artefacts about the culture, lifestyle, of tribal people spread in India. Ticket price is Rs.20 for each. Timings are from 08.30 AM to 08.00 PM. We can have a peek on the lives of tribes such as Chenchu which is the prominent tribes of Nallamala forests, Kolam, Gond, Yanadi, Savara, Lambda to name a few tribes and their practices, culture and lifestyle. 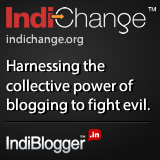 Till in this 21st century, they have not made many changes to their traditional lifestyle. Photography is prohibited inside the museum.There is also a park outside where we can sit peacefully and enjoy the surroundings. After that, we strolled around the temple premises. Many people were going to temple. Many eateries were also there. There are plenty of shops around the street. You can do a little shopping if you want. 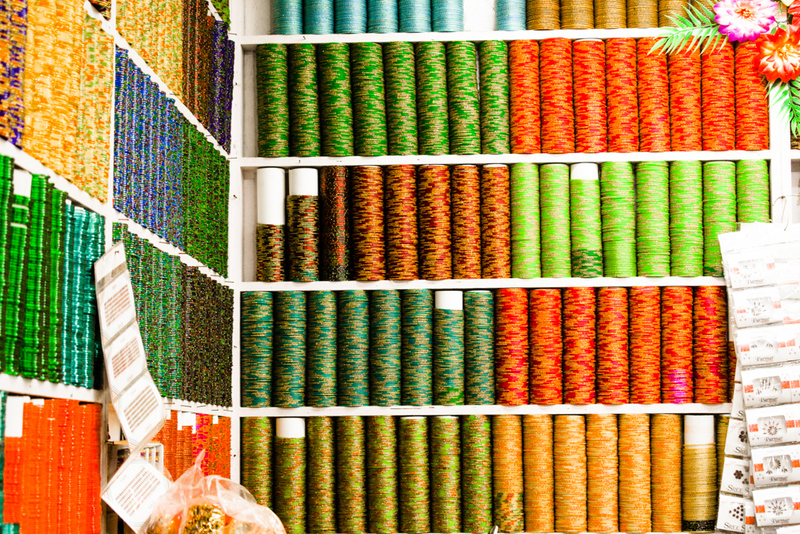 These shops have a beautiful display of bangles, sacred threads and other artefacts, which you can buy as a memoir. All we did is some window shopping. As it was a casual visit we didn't go inside the temple. 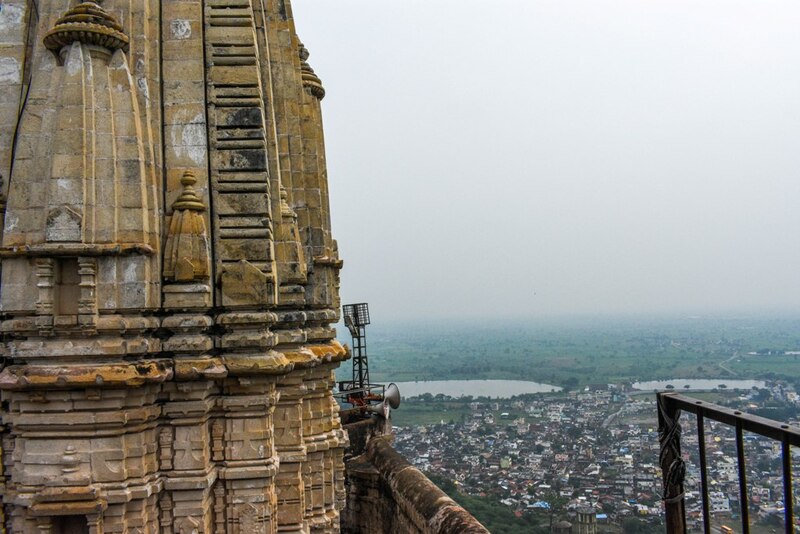 If you plan to visit the temple, dress accordingly, Jeans and such modern dresses for girls are not allowed inside the temple. We roamed around the city till midnight. I felt it as a safe destination for girls who want to travel solo. As it is a religious place, people with families were more. 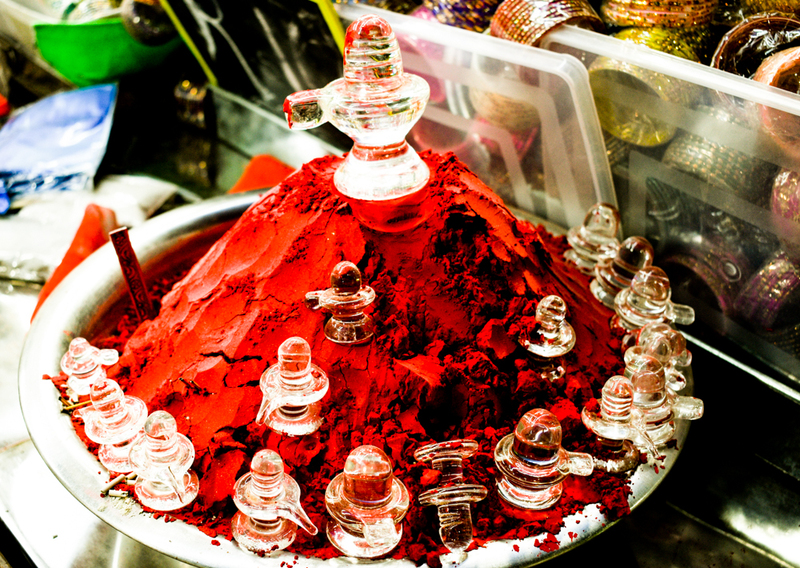 More than as a tourist place, it's a devotional place. We were feeling little adventurous for the next day morning as we were planning to go to Akkamahadevi caves, which is a naturally formed cave. 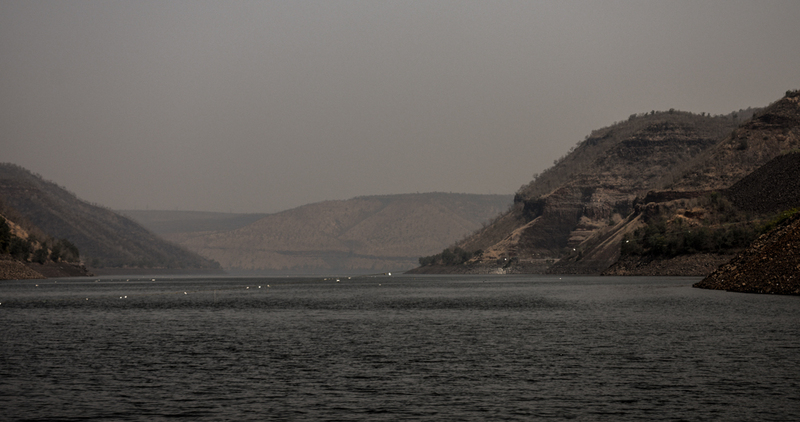 We have to take a boat ride of 10 Km for an hour through the Krishna river and from there trekking for 10 minutes or so to the cave which is very dark. Inside of the cave is only visible if you use a candle or torchlight. So we started from the hotel by 9 having breakfast from an outside eatery, to the Pathalaganga boating point. Pathalaganga boating point is 2-3 Kms from the temple. For our much disappointment journey to the caves was suspended until Ugadi, which is on 18th of March 2018, for animal counting. We arrived just 1 week early, so we missed it. 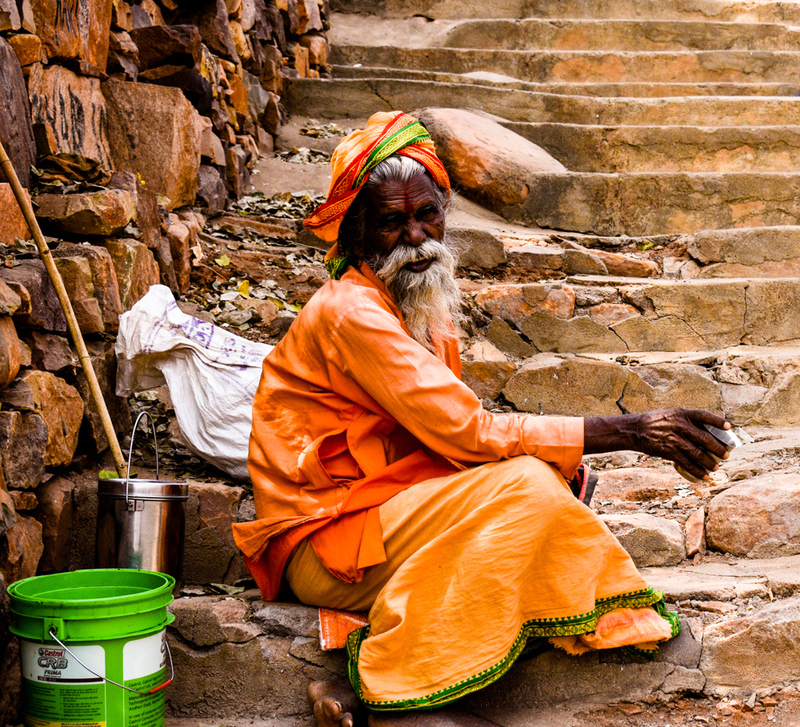 So if you have plans visiting the Akkamahadevi caves, enquire before. 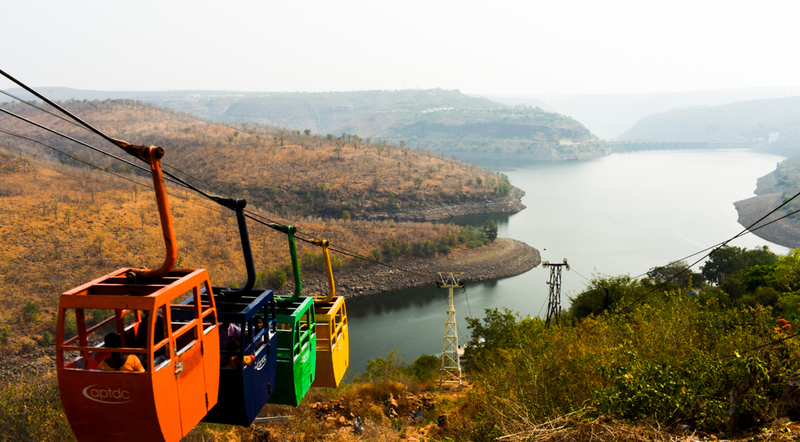 With huge disappointment, we took tickets for ropeway and boating in the Pathalaganga. It cost Rs.118 for each person to and fro. Check the timings, ticket cost and phone number in the above photo. Another number was provided on the ticket we have taken for further enquiries and reservations 9848540371. There were many people who came before us to do the boating, so we had to wait for our turn in a queue for some 15-20 minutes. Though the ropeway ride was not that much exciting, view from the place is magnificent. We will get a panoramic view of the upstream side of the dam and surrounding hills. In each car they will take only 4 people, so only 16 people can reach the boating point at a time. There also we had to wait for other people to come. And there is only one boat which does the service. So we waited there seeing the beauty of the river. 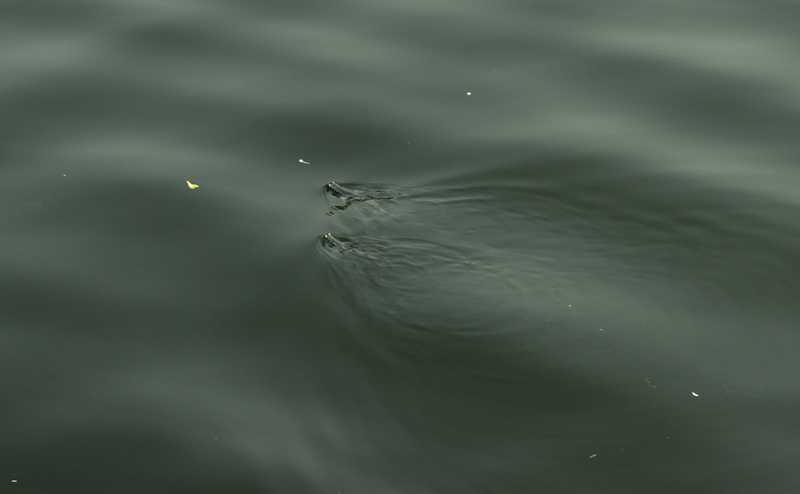 And these 2 fish were giving us a show swimming near to the waiting place. That's our boat approaching to take us for the ride. There are also steps provided to reach Pathalaganga river where devotees were taking a dip in the sacred water and doing pujas. Taking bath in the river is believed to cure various kinds of skin diseases. We started our boating and after riding for about 15 minutes towards the dam, they stopped the boat. One of the APTDC person working in the boat, started explaining the significance of the place and about the temple history. 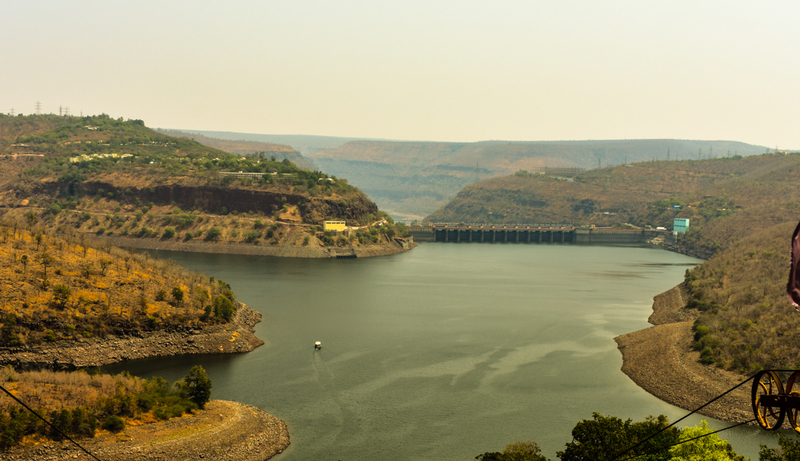 River Krishna's originating point is at Mahabaleshwar in Maharashtra. Magnificent view of the hills from the river. There were people selling offerings to god on the pavements. After the boating, and ropeway ride we were planning to return back to Hyderabad. While boating, the guide showed us this building for paying homage to Sree Shivaji Maharaja's visit to Srisailam temple. 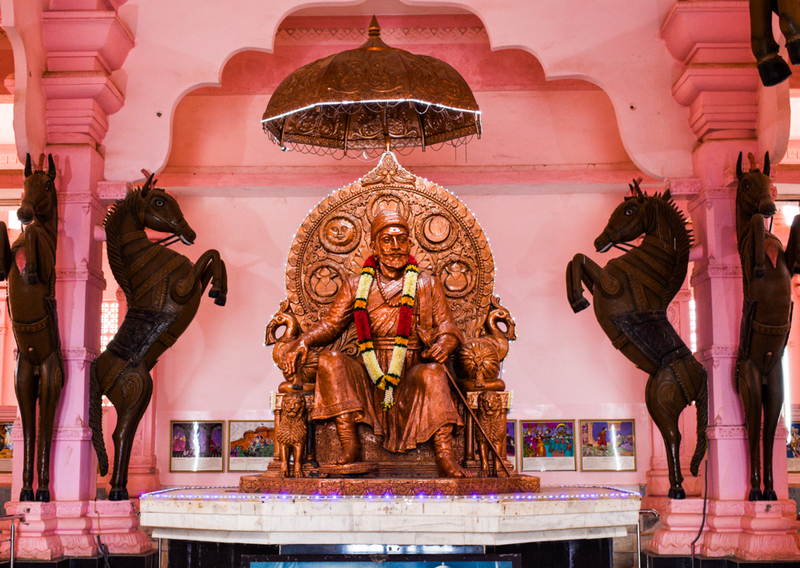 Its named as Shivaji Spoorthi Kendram, where there is a bronze statue of Sree Chatrapati Shivaji in a hall painted with pleasing pink colour and paintings depicting his life. It is believed that Goddess Bhramaramba, blessed Sree Shivaji for his penance and granted him a divine sword to fight the evil. Its open from 06.30 AM to 08.00 PM. 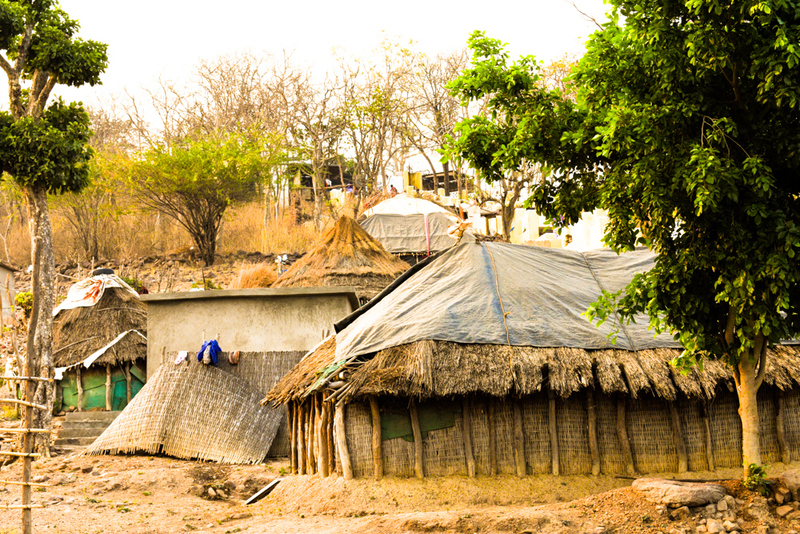 Now this place provides accommodation, free medical facilities and food for the poor. 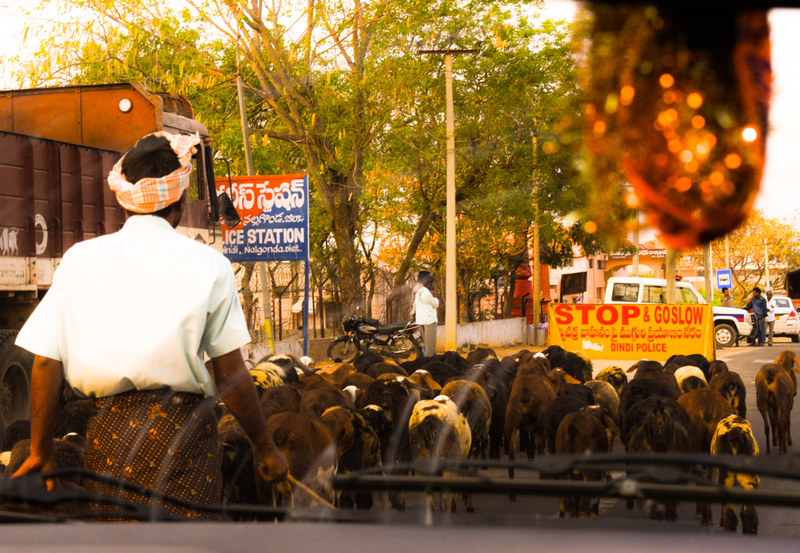 After our Srisailam visit, we started our way back to Hyderabad. 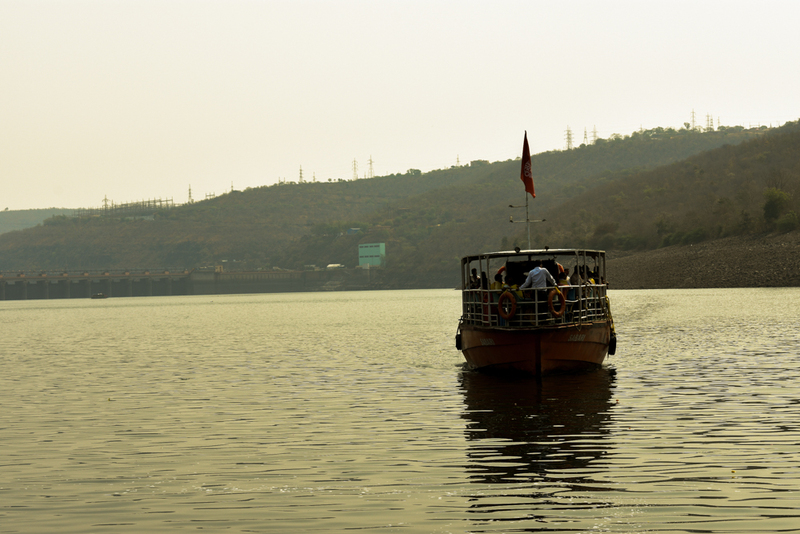 As we were receding the ghat roads from Srisailam, we found this small round boats called coracle. We couldn't miss it, we took the ride. 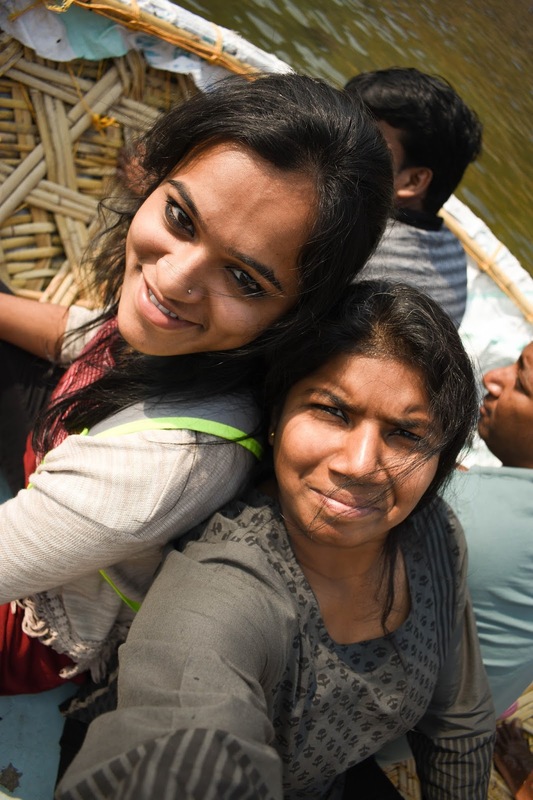 Read about our coracle ride experience, and where you can find it in here.. It was evening when we started our back to Hyderabad. 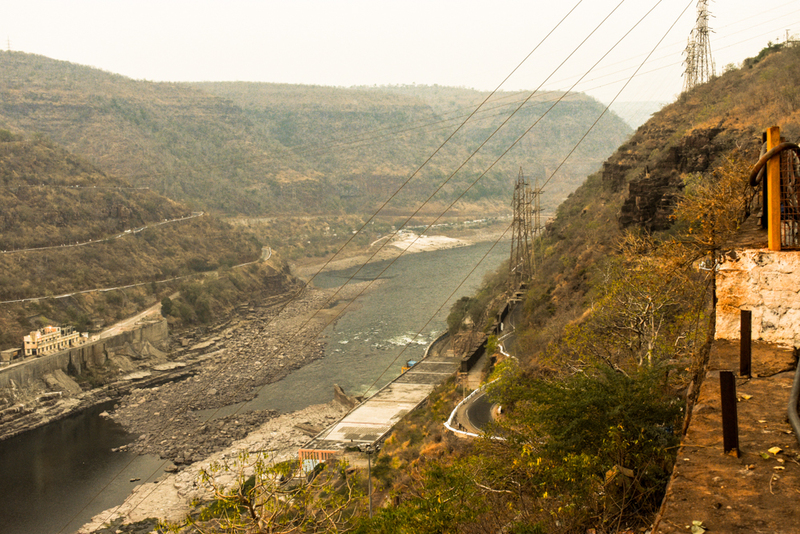 Our two day trip for the weekend was well spent in Srisailam. Again back to the busy lives of Hyderabad, as we wait for the next weekend. 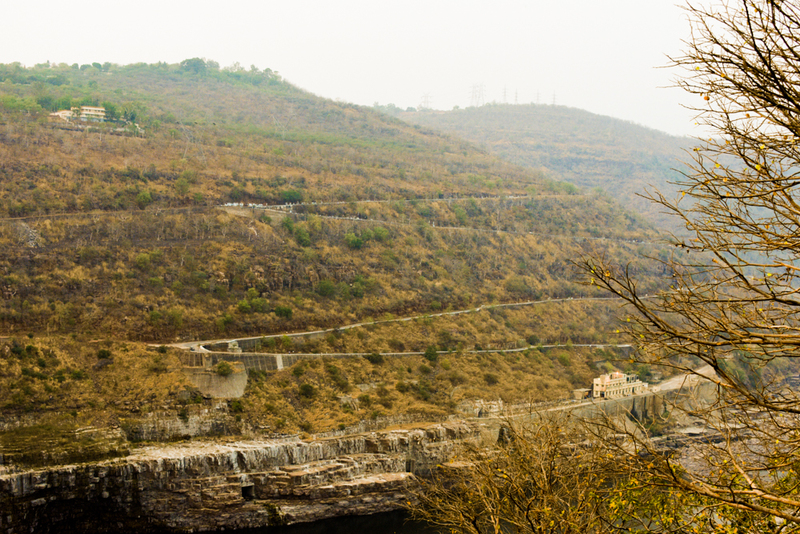 Know more places in Srisailam, share with us..